A nice selection of colors here but not much in terms of aged pieces. My family has a collection of "return it to the sea" pieces that are destined for somewhere. Where can I put the sharper pieces into the ocean without it being littering? Ah the duality of beach-combing. It's not littering, I do the same thing. My thoughts are I return it to the sea to complete it's work of creating a beautiful treasure. The first thing to do is search on Google Maps (or your favorite mapping website) for Discovery Park , Seattle. There is a small parking lot down by the West Point light house that you can use if you have small kids, elderly, or handicapped people who want to enjoy the beach without hiking. If you think that's you, stop at the Visitors Center and grab a parking pass. Then take Utah Ave all the way down to the beach. Go North or South along the beach for some sparse but nice pieces. 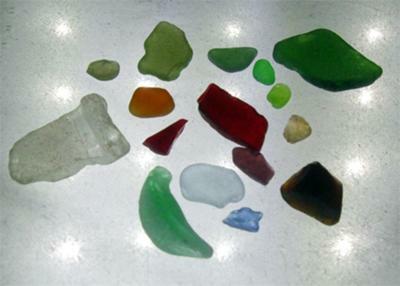 I will be traveling to Seattle and I am eager to look for some sea glass. Where is Discover Park and when is the best time to go? I want to find some of those nice colors!